Depron Delta version 2 - AUW 183g. 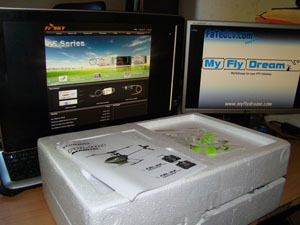 4 channel, stre..
Hand launch models - increase grip for launch with..
HobbyKing sell this RTF 3D helicopter for just $109.99! (at time of this posting). First of all HobbyKing use the original box of the helicopter to send it in, turning it inside out to do so, so don't expect boxes inside boxes. Here we go opened up (it's taped on 2 sides). It already looks super nice and RTF, I did a voltage level test on the 3.7V 300mAh 30C lipo packs and there where nicely in storage mode mid-voltage. BEWARE the wall charger as you can see if you live inside EU is no good, so you'll need to make your own loom / Buy an adapter OR use your own lipo chargers like I did. Everything in the box is a nice tight fit so no chance of things coming lose from idiot post delivery services. The transmitter requires 4 * AA batteries but there is also a 3 pin servo plug type socket so you could also put a lipo in! Super nice feature and saves modifications later. Now with all the pieces out you can see it's a very tidy set-up, the lipos are pretty flat for the fit inside the canopy bottom. When inserted its a good snug fit. I've asked around and I don't think you can bind this with any other transmitter. 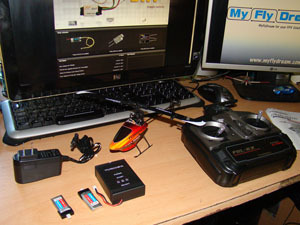 I back this up with the BIND procedure being: Turn on transmitter > plug in heli > wait > fly... There is no button or such so I don't see how you could bind it with anything else, sorry folks. 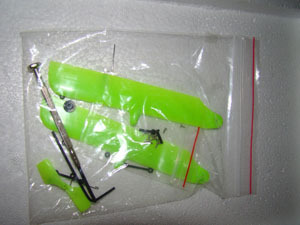 The spares bag includes a basic screw driver , night blades (replacements), allen key and head parts and linkages. Over all really not bad and soon all the replacement parts I'm told will be on HobbyKing for cheap. The quality of the materials is excellent, even the canopy has no mould markings or the rest of the model. I've already found a couple of videos on the net mostly from China of a man flying indoors, looping over inverted and hitting the floor a good few times. After you can see there is no damage, although I don't fancy testing that out for myself. Close up it looks nicer still, a super sharp print on the canopy instead of the normal pico style "stripe" or half smudged text lol. I was wondering if the power lead tucked in anywhere for flight but when connected to lipo it pulls in and well clear of the landing legs. On the head itself once connected there is LOTS of throw movement on the head although the yaw left right (tail) is not as fast as the head is in response. 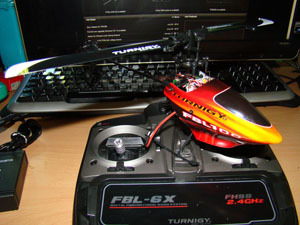 Overall the RTF helicopter is excellent for it's size and price, so yeah you must use the stock transmitter but for what your getting it's more than acceptable. The transmitter doesn't feel cheap or look cheap with some fake stupid stickers on it or such. Pay attention regarding throttle hold switch!!!!!! The manual states to put throttle on before plugging in the lipo (naturally) but does NOT say which way that is! OFF is TOWARDS YOURSELF, ON is AWAY (down), this is completely opposite to what I use lol so cut my fingers a little, pay attention! I was flying in a little wind so it was not perfect for it's maiden but I don't care, this little helicopter blasted around the sky like the big boys while keeping nice smooth movements instead of being twitchy as many mini helicopters are at speed. Flips or tick-tocks will seriously drop the head speed to the point that you will have to recover, I was able to do 3 tick-tocks (tail down) before the rotor speed was so low I thought it was going to drop out of the sky. Inverted flight isn't so hard with this helicopter however the flip over vertical height needed is about 1 meter so if you live in a tight space don't think about it. 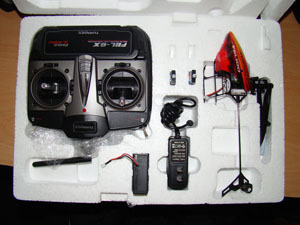 The controls allow you to hold throttle and change from regular normal flight with linear throttle and then switch to 3D. One last thing I want to mention is regarding throttle hold, I tried it out to try auto-rotate to land from only 2 meters or so high. The blades stopped almost instantly... auto-rotation ... erm.. nope lol, drop out the sky like a brick - tick.